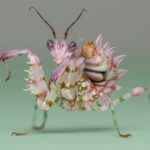 Pseudocreobotra wahlbergi, or spiny flower mantis, is a small-medium sized Flower Mantis, native to southern and eastern Africa. The adult has spiny structures on the underside of its abdomen, giving it its name. It is variable in colour, being typically greenish, but it can equally be yellowish, pinkish or reddish. It has a striking spiral “9” mark on its forewings providing a conspicuous eyespot in black, green and cream surrounded by a green patch. The hind wings are orange on the inner part and transparent on the outer part. The species is common in captivity and is easy to rear.